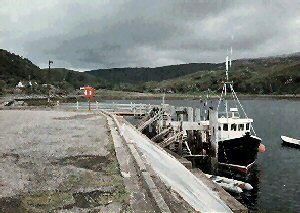 The ferry from Toscaig, just south of Applecross, to Kyle of Lochalsh, closed down some 30 years ago. At a meeting of the Highland Council's Transport, Environment and Community Services Committee in September 2004, it was noted that a mussel farmer had made an application to purchase the pier and associated land. It was noted that the wooden structure of the pier was dangerous and of no future use; however the adjoining concourse area might be of some importance to the community. It was agreed at the meeting to declare the pier surplus to requirements and as such made available for disposal.